Best Mole Poison - Which Brand Should You Buy? Choosing the best mole poison not only saves you time and effort but it reduces the amount of money you spend on poor quality poisons or gimmicks that just don't work. When it comes to mole removal you basically have two options that work…….traps and poison. While trapping is still the number one way of removing moles from your lawn, not everyone is interested in labor intensive traps or having contact with dead moles. For those who decide trapping just isn't an option, a good quality poison is your next best choice. Here's the problem with poison…….in the past poison hasn't been effective. Many of us know someone (maybe even yourself) who has pushed countless pieces of "bait" in a mole tunnel only to find it didn't work. Here's the good news! The formula of mole poison has changed and it's now very effective. Although poison is still highly controversial because the dead moles are underground and you don't get actual "proof" the poison worked, many people who use it report excellent results. When choosing a mole poison it's important to know that moles are insectivores and their main diet is earthworms. Moles do not eat seeds, bulbs, plants or nuts so using a rat, gopher or mouse poison will not work. 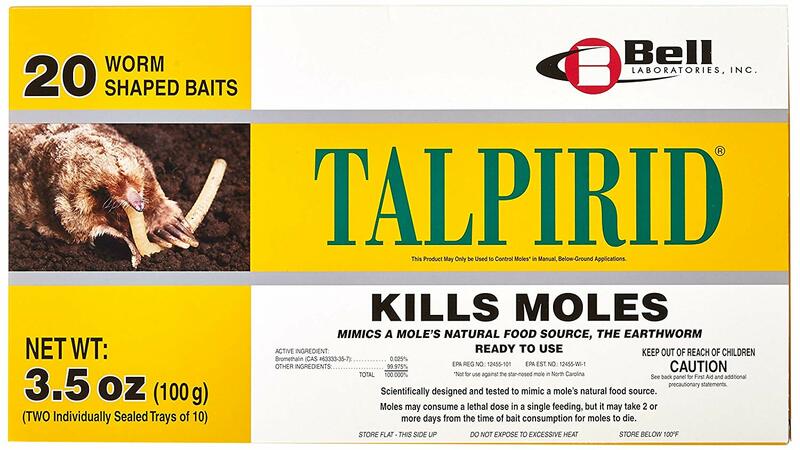 The most effective mole poison on the market today is the Talpirid Mole Bait. The baits earthworm design has a formulated smell and flavor that moles actually eat! Talpirid uses Bromethalin as the active poisonous ingredient. Bromethalin is a very effective mole poison and can kill a mole in one feeding, usually within 24-48 hours. To use the bait simply find an active mole tunnel and place a worm inside. Close up the tunnel to prevent unwanted exposure and that's it. After consuming the worm the mole typically dies underground eliminating any unwanted contact with the deceased animal. Talpirid Mole Killer can be found at many large home improvement stores or it can be found purchased online. Amazon also has many positive reviews from customers who have used the product. If you notice mole damage in your lawn or garden this year and you need a easy and effective way to get rid of them, consider using the Talpirid Mole Worm. This newly reformulated poison offers a great alternative to trapping. They're easy to use and they work!